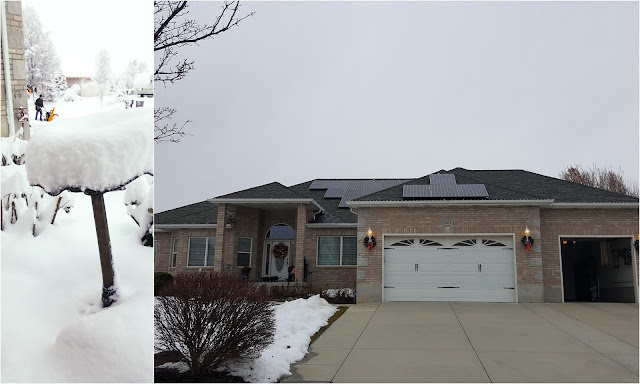 After much research and discussion, we decided to take advantage of the tax credits offered for solar panels and have them install on our roof. That was in November. A month later, the company received the needed permits from the city and scheduled our install for December 15th. 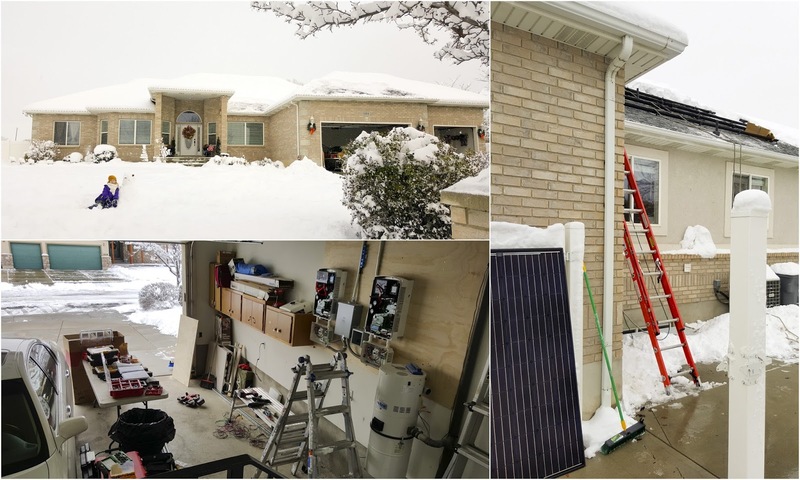 In order to qualify for the state and federal refunds, they must be installed, must pass inspection and the application for net metering must be submitted to Rocky Mountain Power. We thought we were doing fine on time until the day prior to the install. We had at least six inches of snow fall in one day. It looked beautiful but it made a lot more work for the installers. They spent the entire morning shoveling snow from our roof and throwing ice melt so they could work on it. By the end of the day they were less than half way done. We had to wait until Saturday for them to come back and finish the install. We have a mixed system with more powerful panels up front and less powerful ones on the side of the house. We chose to go that route so that we will be able to offset 100% of our power bill. We would have needed 40 of the 285 Watt panels to accomplish it and there wasn't enough roof space for it. When the inspector came in to check the work, he found a couple of minor things that needed fixing. The crew was at the house again this week taking care of it but the inspector couldn't come out to check on the completed job until January 4th. If everything passes inspection, he can back date the document to December 31st since in theory everything was ready to go before the end of the year. We are keeping our fingers crossed that it passes. If it doesn't we will still qualify for the federal refund which is approximately 75% of the total amount we expected to get back, but will have to wait until 2017 to get the balance.